It is very humbling to see a bible like that, which I have. I am in no way bragging because I don’t have the right, but I am finding it hard to find any more empty spaces in my own bible, but I love it. 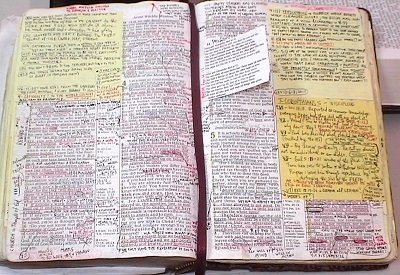 My grandmother owned several bibles and filled them to the edges with notes and highlights. She left her kids and grandkids one each, (and there were a lot of us), and I fully intend to do the same for my family. It is so neat to look back on those notes and admire them. It is nice to know that some people still treasure a family Bible. You are a blessing to your family, God bless.